Cell Phone & I-Pod Solar Charger (With Case) - Always Be Connected! Charges In Sunlight In 11 to 13 Hours. Solar Panel Charges In Direct Sunlight In Only 4 to 5 Hours. Rechargeable Lithium Battery Charges On Your PC In Just 2 Hours. Comes With Zipper Carrying Case. Includes 1 USB, 1 Discharging Cable & 6 interchangeable Connectors. Blister Carded. Fits Motorola V66, Motorola V3(i), Samsung A288, Nokia 6101, Sony Ericsson K750, iPhone 3G Type Cell Phones, iPod Nano, iPod Video & iPod Touch Players. 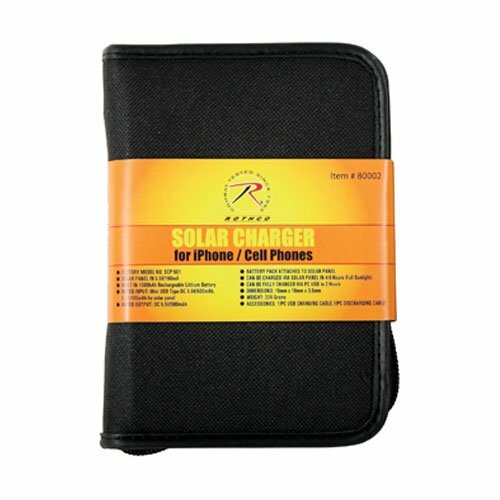 Solar Panel Charger - Charged by the sun to charge your electronic item anytime and anywhere. GREAT FOR HUNTERS, CAMPERS, TRAVELERS & MILITARY USE! Also Great For Soldiers In The Army! A Truely Great Gift for anyone!